"Jane Bryant, Westbrook College, Class of 1973"
Westbrook College student Jane Bryant, Class of 1973, was a Retailing major and lived in Goddard Hall. 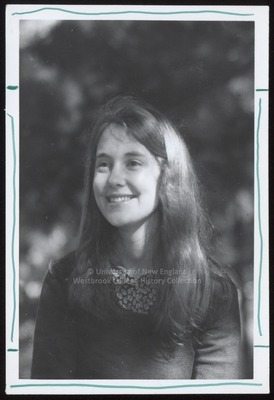 For her senior class candid photo, which appeared in the 1973 Tower Yearbook, she wore a dark, pull-over sweater with a figured blouse beneath.Her dark hair was longer than shoulder length and parted in the middle. Margaret poses outside but her background is blurred.